A reliable range of both flooded and VRLA batteries specifically designed for the high power requirements of the most demanding uninterruptible power supply systems ranging from workstations to data centers and all needs in between. The world's first 16V front terminal UPS battery. 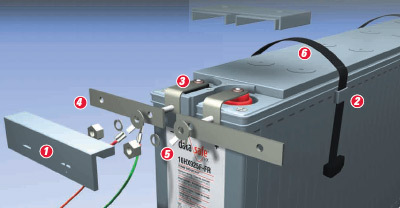 DataSafe® batteries. More power, less space, easier maintenance. Eliminate the difficult maintenance and burdensome space requirements of top-terminated 12V UPS batteries. Revolutionary, new front-terminated DataSafe 16V UPS batteries, available in 500 WPC, 800 WPC and 925 WPC sizes, are more space efficient, more cost effective, and easier to maintain than 12V batteries. They use proven VRLA technology, are conducive to incorporating monitoring systems, and scale easily to larger capacity UPS systems with one-third fewer parallel battery strings. Offering superior value, especially in UPS applications, the DataSafe NPX series is designed for high rate discharge applications. 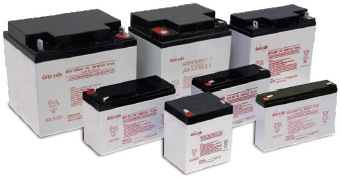 These batteries are used primarily where high power is required for a short duration. DataSafe HX is the ideal source of power to protect vital systems. The HX range from EnerSys offers an unsurpassed reputation for excellence and improvements on industry standards for performance. Thick ribbed polypropylene plastic containers provide high mechanical strength and superior safety features.